Summer is back and with a vengeance! 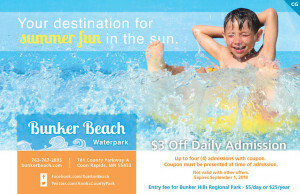 It’s time to take the family on a well-deserved break and save money using this Bunker Beach Water Park Coupon 2014. It’s time to save $3 off of your daily admission valid for up to four (4) individuals with this one coupon all the way through to September! So, yes dad! You too can join in on the water park fun in the sun. This 2014 Bunker Beach WaterPark Coupon is just as good as last years… You get free admission for kids 1 year old. There’;s teh discounted Twilight Admission price reduced for entry after 4:00pm and if you’re under 48 inches tall, you’ll get in for only $12 for the whole day! Minus the $3 savings!. The bottom line is that you’ll have some amazing fun this summer at the Bunker Beach Waterpark and it will be the best family experience this year yet! 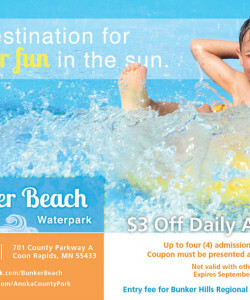 Save $3 on your admissions with this coupon (Valid on 4 people)! Free for 1 year olds!